Version 18.12 is now available for DOWNLOAD! The new Mask: Apply filter makes it possible to mask filters without using multiple tracks! Use Mask: Simple Shape or Mask: From File to start the filter mask followed the video filters to be masked followed by Mask: Apply to apply the mask to the filters in between. Filters before or after the mask filters affect the entire video frame. 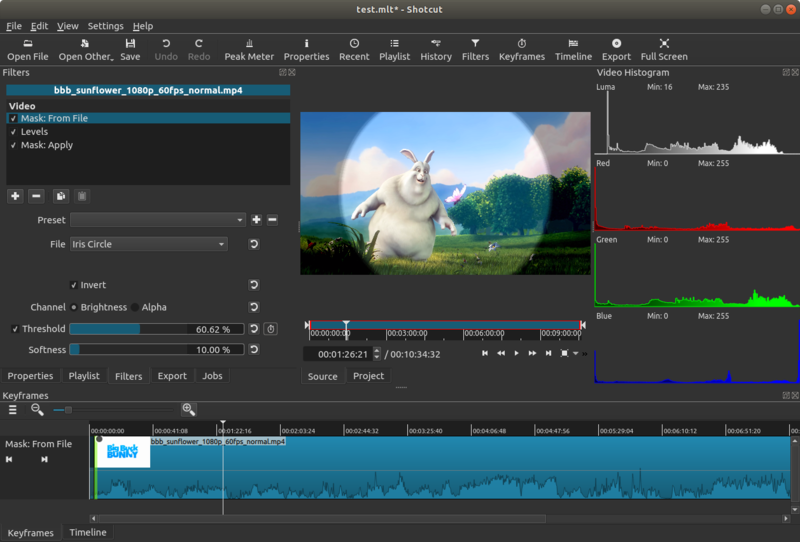 One can still use Mask: Simple Shape or the new Mask: From File to affect the alpha channel for multitrack compositing as before. Added View > Scopes > Video Histogram. Moreover, Threshold can be animated with simple or keyframes, which is especially nice when used with luma-wipe image files (stock or custom). Not only can you wipe on a filter but also you can use this as an alternative way to make a wipe transition using multiple tracks (instead of same track transition). When Reverse job completes, automatically open it and add it to the Playlist.